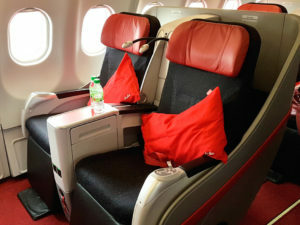 On most long haul flights I choose to travel on Emirates because I think they are offering one of the best products when it comes to aviation. The connections are convenient and you can reach virtually any destination worldwide. 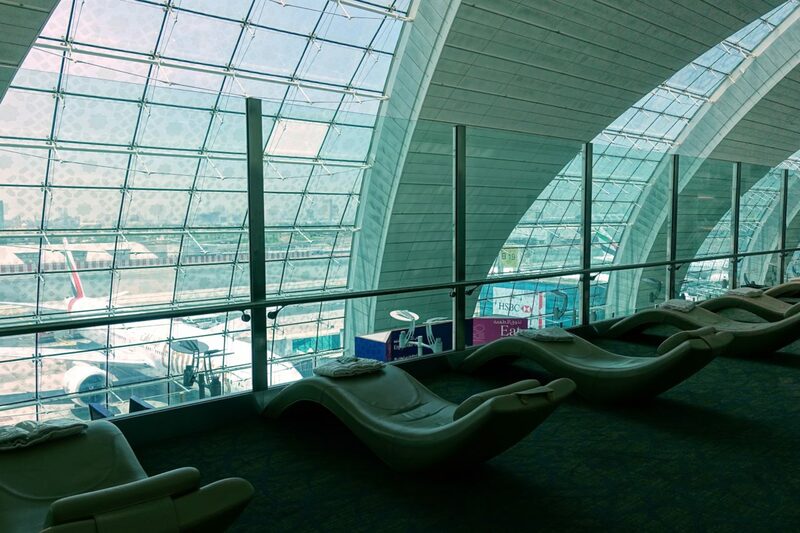 Consequently, I get to pass through Dubai International Airport DXB quite frequently. I do not fly business class on all occasions obviously but when I do, I make sure to bring some time to visit the awesome Emirates Business Class Lounge. Because I am travelling a lot for business reasons alone, I like to spend the hours at the airports in the best way possible. 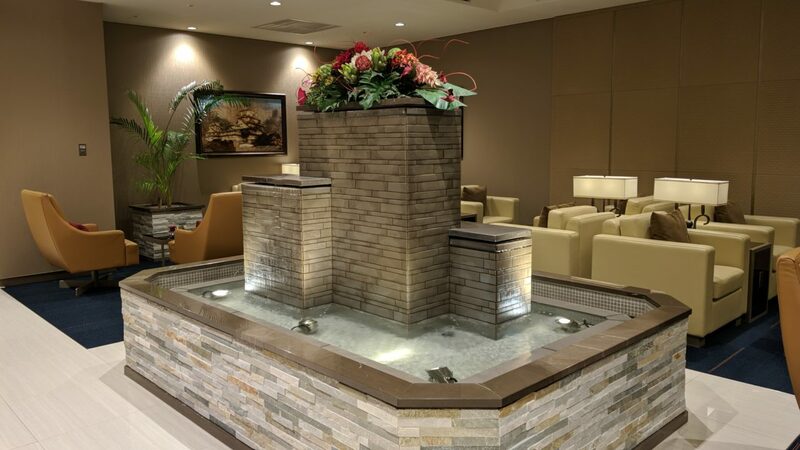 Through Priority Pass I am able to access most lounges while waiting for boarding and have experienced more than a dozen in the recent years. Its good to have refreshments at hand and stay connected to work or friends in a rather comfortable way. The Emirates Business Lounge however is different. 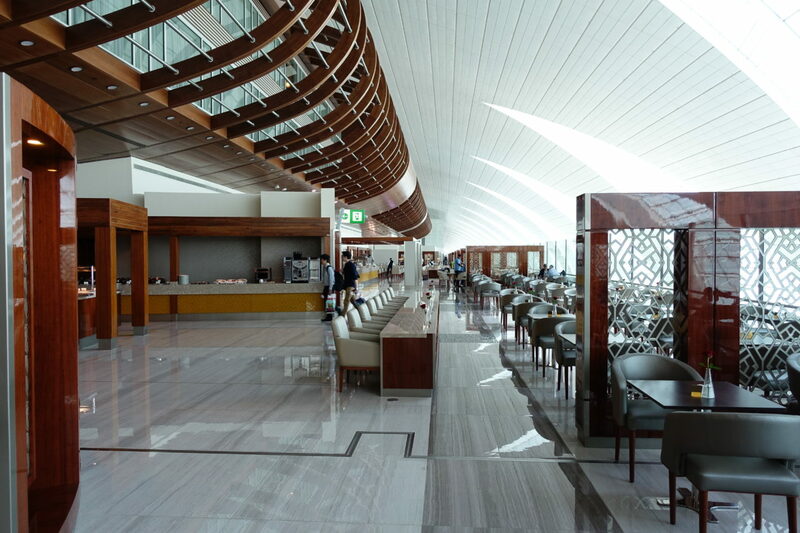 It spans over a massive part of the first floor of Terminal 3 in Dubai and is not comparable to regular lounges at all. The space alone is breathtaking. 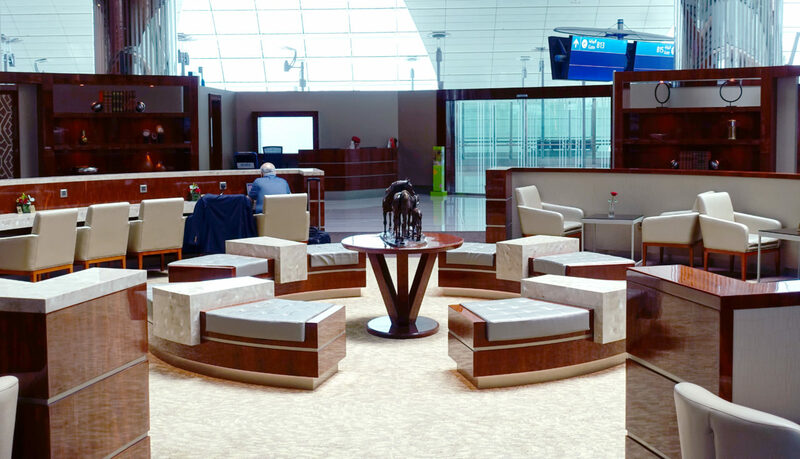 The Emirates Business Class lounge feels almost like an own terminal. There must be more than 500 opportunities to sit down – at any table height you prefer. Couches, chairs, loungers, more couches, more chairs, ottomans, community tables. They have everything. While it gets populated at some times, it never feels really crowded. Most of the seating options also offer power outlets to recharge. You don’t need an adapter, they even have wireless charging by now. As you’d expect by now, Emirates goes nowhere short when it comes to food. I counted four massive buffet stations and bars, but there may be more. 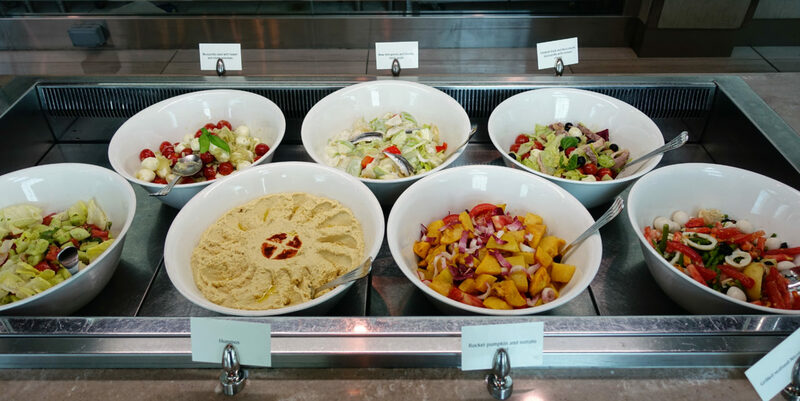 You get a decent choice of starters, hot and cold dishes, salads, fresh fruit, juices, soft drinks, coffee. 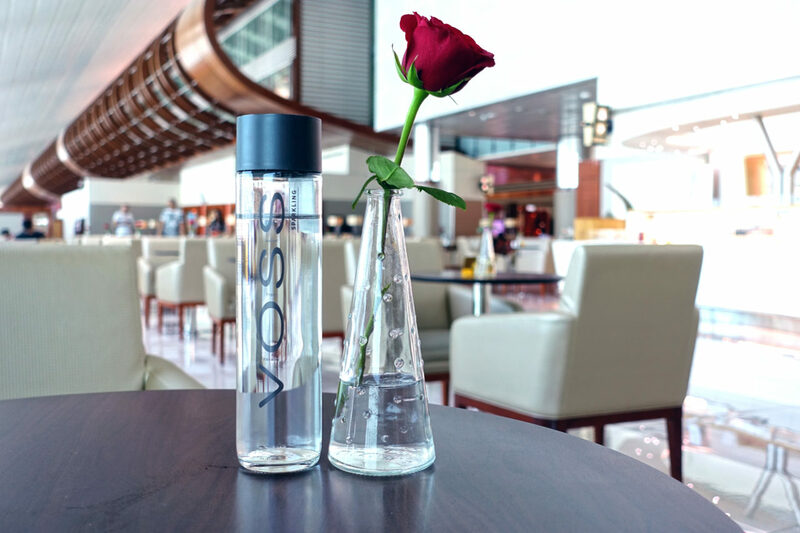 The water is (still) provided by VOSS and I love having some sparkling water from time to time. 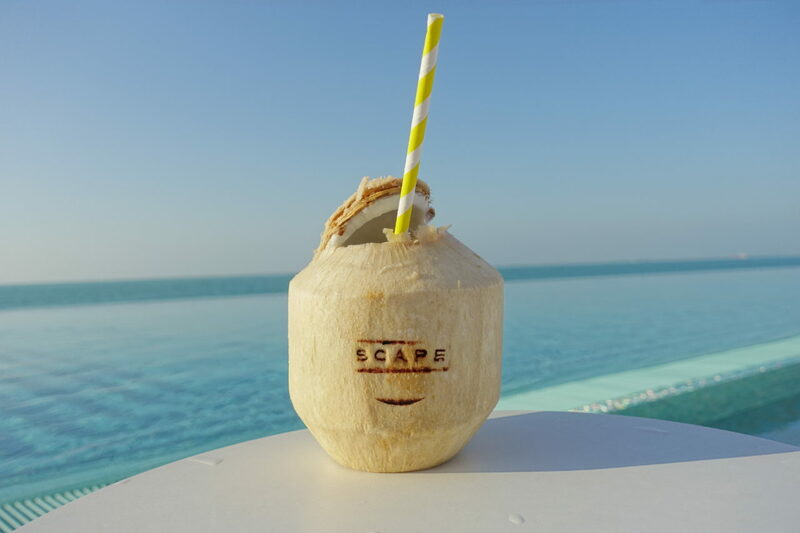 All stations are serviced by friendly staff and you can order your choice of longdrinks, cocktails, wine and champagne as well. They have Moet champagne and some good white wines, I never tried cocktails or long drinks though. Your table gets cleared frequently and you could even order your next glass at the table. Everyone of the hundreds of staff in the lounge is smiling, attentive, friendly. Moet champagne, wine, longdrinks and cocktails – how much can you take? My favourite is the special healthy station though. Tucked away on the left end after entering the lounge, a futuristic looking buffet is offering light and lovely options such as beetroot chips, light chicken wraps, salmon carpaccio, ginger and carrot juices (yummy! ), water with mint and lime, fruits, any choice of salad and fantastic teas. 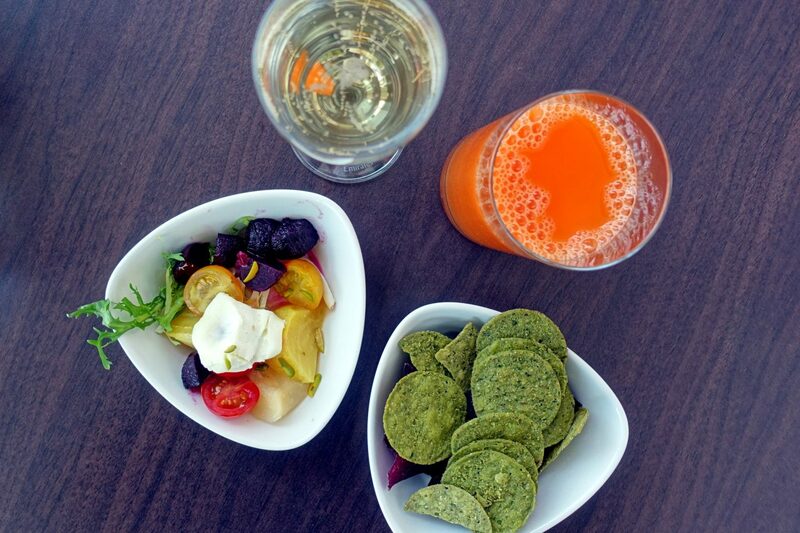 You can even grab some apple, mandarine or pear to enjoy on your flight. An (almost) all-healthy option before my flight. Pro tipp: If you are on a night flight and don’t mind “missing” the food service, think about having a thorough dinner in the lounge. I found the food to be at least at par with the one on board. 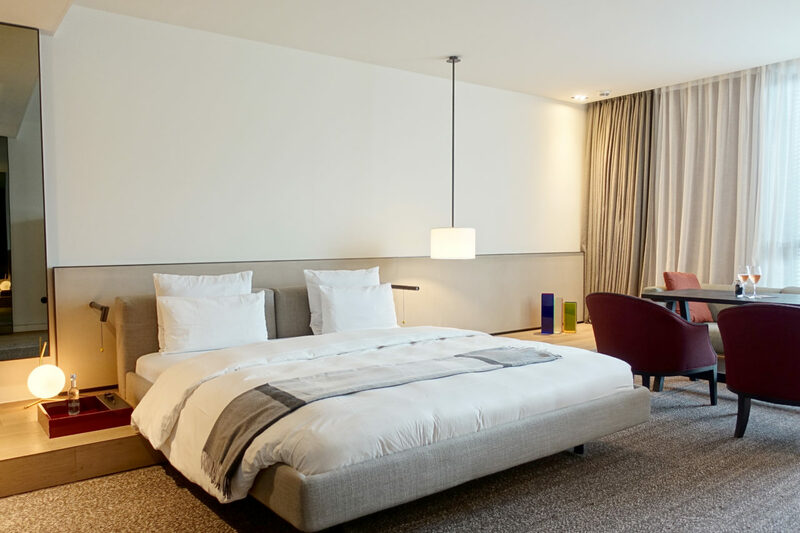 This way you can directly “go to bed” once reaching cruising altitude and maximize the relaxing hours on your mattress in Emirates Business Class. Asides from clean and spacious restrooms, the lounge features (utilisable) showers with fresh towels provided. I never took one but as business class passengers do not have a shower on board I can imagine it’s nice after a long flight from, let’s say, Bangkok. 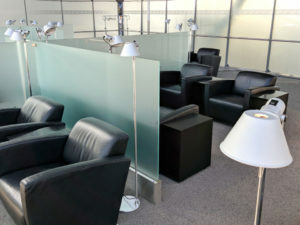 There are also low-light resting rooms with bed-like loungers (fresh blankets provided too), a bit tucked away from the main aisle of the business class lounge. 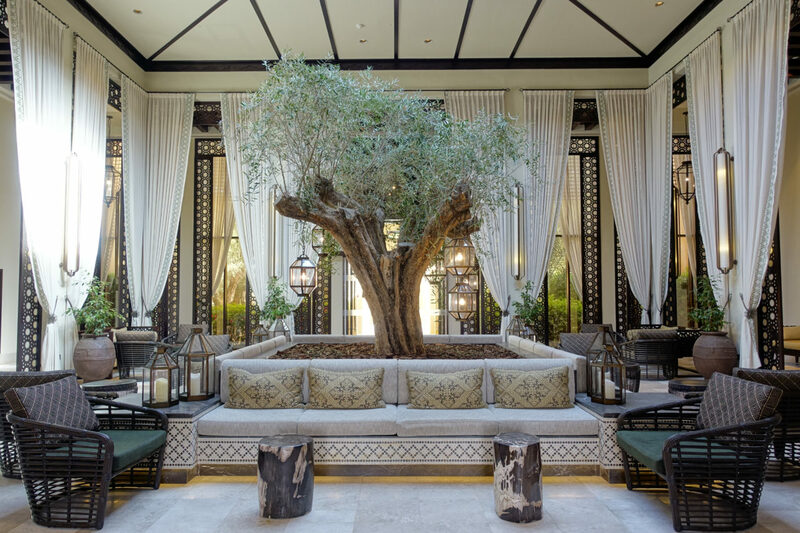 Additionally, there are open space loungers to doze while staying near the buffet. Near the entrance, you have a small selection of books and magazines aside from the departure time screens. I did not spot a dedicated area for children (though I know that Emirates First Class Lounge has one) but noticed there is also a business center available where you can use Apple computers, printers and the like. Needless to say, the dedicated lounge WiFi is great, speedy and not filtered. 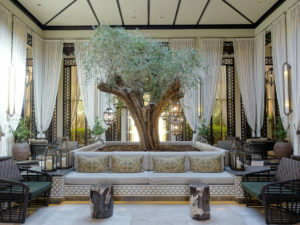 There is also a branch of Timeless Spa within the lounge (unfortunately not using my favourite Dr. Schrammek products) where you can book a short treatment such as foot, back or head massages. I did not have one yet but really plan on doing that during one of my next longer stays there. A shoe shine service and Emirates Skywards service desk round up the offerings. What I also consider pretty efficient is that you can board some flights (I did not figure out the system) directly from the lounge level, so you don’t have to pass through the terminal again. If you are not convinced about the lounge yet, I’ve got one more: There is a complimentary COSTA coffee righthand after the entrance. 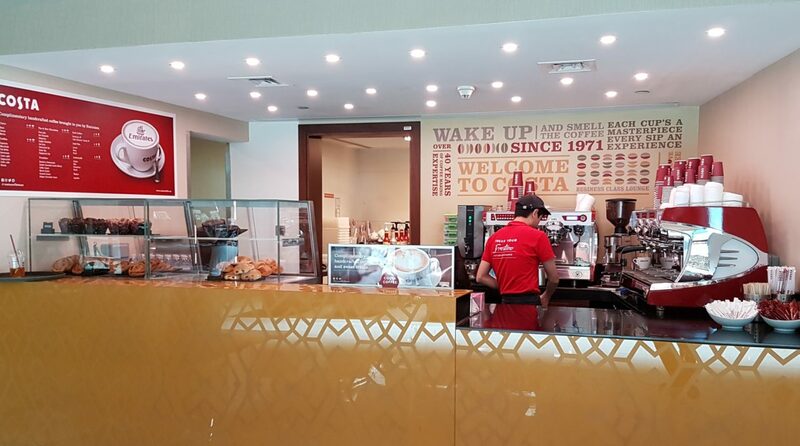 A – who is a real coffee addict – was thrilled and took his favourite iced latte to-go aboard the plane 🙂 You can choose from the whole hot and cold beverage offering that COSTA has to offer, any size and even grab some of their pastries. 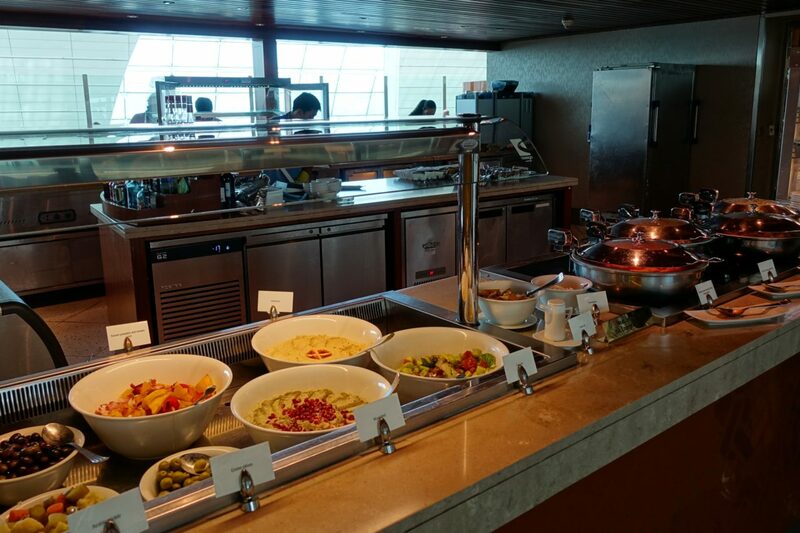 In my opinion, the Emirates Business Class lounge at Dubai International Airport is the benchmark for any lounge. It feels like the futuristic blueprint of how travel is meant to be. It sweetens any necessary layover for me and I would highly recommend the experience for any traveler. 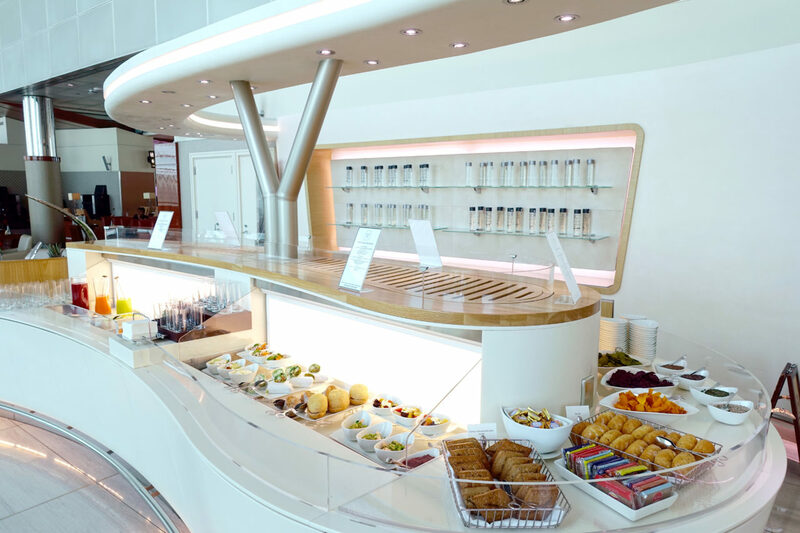 As Emirates is facing tougher economic conditions, they’ve opened up access to the lounge for (Skywards) Economy passengers as well – although it comes with a noticeable price tag. I’m not sure if this extension might alienate some of their loyal customers over time but at present utilizing the capacity that’s already there is a comprehensible business decision. +1 on your bucket list! 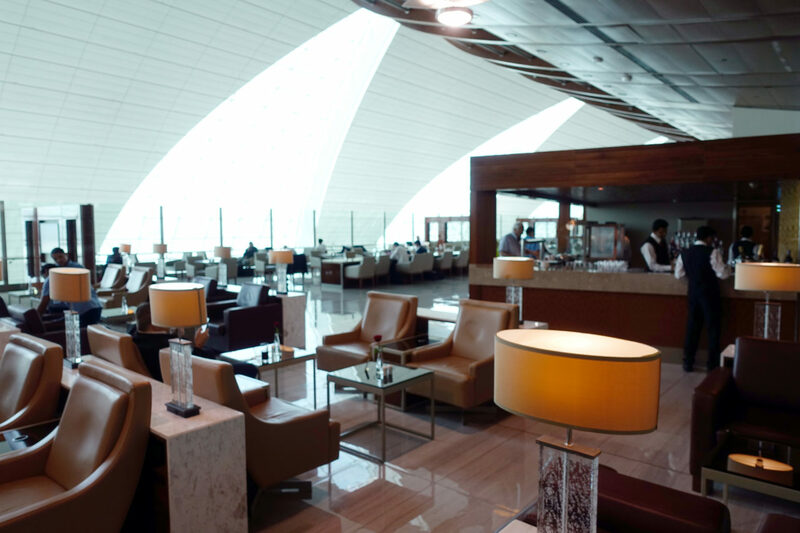 Like to check the cheapest Emirates fares to experience the fantastic business class lounge on your next flight? 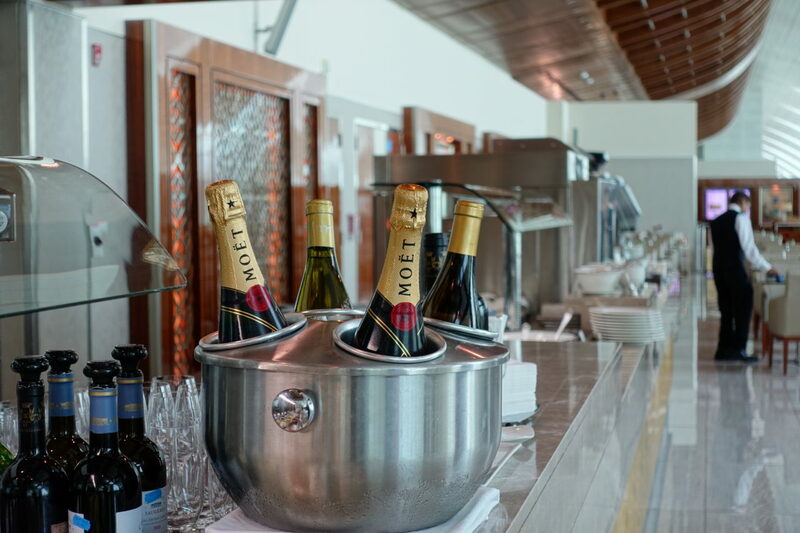 Also, you might be interested in my review of Emirates first class lounge here on P&P!